Stopped by the auto store today and saw this hanging on the POP display rack. 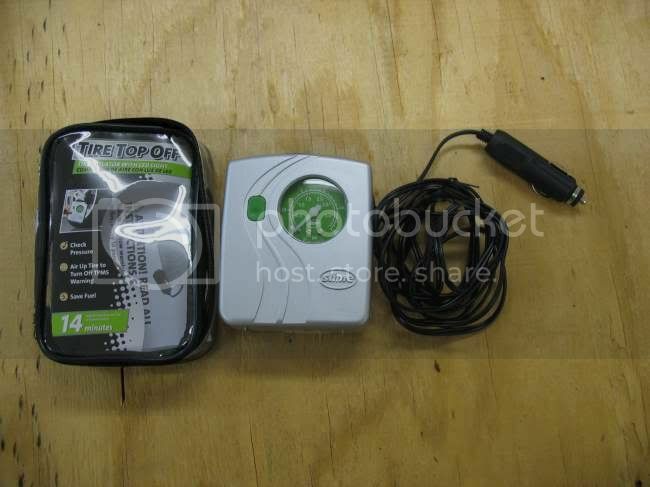 The Slime "Top Off" mini-compressor and tire inflator. For $12, what could I lose? Turned out it's pretty handy. Only about the size of a paper back book, it has a screw-on type connector for a secure lock on the valve and 5 inches of hose (also included an inflation pin for balls and a nozzle for rafts and blow-up toys). I can imagine for a motorcycle this time would be halved. The unit did get warm and the instructions caution using it over 14 min continuously, suggesting a 40 minute cool down time between prolonged use. The gauge had an error factor of about +/- 2 lbs but for emergency use, casual fill ups, or maybe even a quick trackday pressure adjustment (go +2 over your target, bleed the rest) this isn't much of a concern. 12 volt cord is more than adequate to make it from the power source to any tire. There's at least 10ft to play with. The Tri-LED light at the bottom is plenty bright albeit a bit useless for its intended purpose since it's located at the bottom of the unit. You end up lighting up your foot or blinding yourself. I'm not expecting phenomenal performance or longevity from this unit, but for $12 I think it will adequately do the job inside my glove box or in a motorcycle tail case/tank bag. 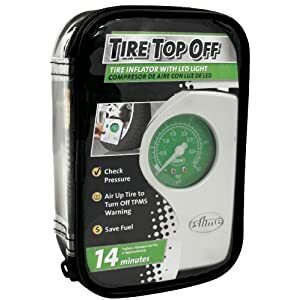 Particularly handy for those slight pressure adjustments or when you wake up in the morning to go to work and find the tire flat. At least you can throw enough air in the tire to get you to a shop without having to get dirty pulling out and installing the spare. Last edited by Heist; February 1, 2012 at 06:31 PM..
Good deal. Will be touring with one this season for sure. Yup, got one for these and a tire plug kit stored away in my hump/rear cowl on my Busa.